Spring is fast approaching, and as promised we have planned a Road Rallye for early spring. Infact so early, that it is scheduled for the first day of spring. 40 years ago Paddy Hopkirk won the Monte Carlo Road rallye in a mini. 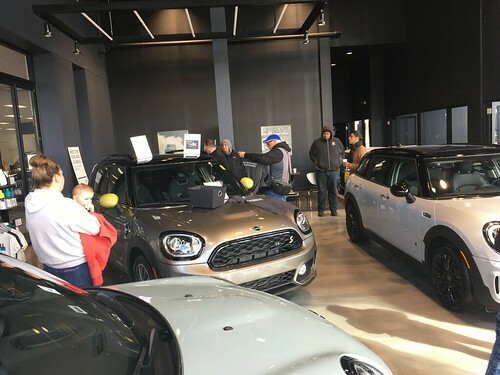 Maybe you can win the 1st ever Chicago MINI Poker Run! Who: Open to all CMMC members, their navigators, and people wishing to join the club. What: This is a Poker Run road Rallye. Where: The start is at Knauz MINI, Lake Bluff. When: Sunday, March 21st. Check in is at 10 am. Drivers/navigators meeting at 10:20am. Why: It?s spring! Let?s put the windows down and drive! Remember, as this Rallye is on a Sunday, Knauz will be closed (no bathrooms at the rallye start). What?s happening: We will be departing from Knauz at 1 minute intervals beginning at about 10:30 am. This is not a race. There is really no advantage to being first, or last, as your fate is all in the cards you draw at each of the 5 locations. Prizes (of the nifty sort) will be awarded at the final stop to the best poker hand. A huge thanks to Mini Mania for helping us out with this! Bring a map of the Chicago area. Bring someone who can read a map. A cell phone and or FRS radio may come in handy if you need assistance (real men don?t need directions). Cash, or a credit card. As with most of our drives this one has food on the itinerary. Can?t tell you, it?s a secret. Actually at each of the first 4 stops, you will get a destination sheet along with your poker hand card. We think we will be done between 3 and 4pm. Sign me up, I?m lucky at cards? Mini Copper was designed for!! set of Yokohoma ES100's without having to dodge traffic out to Schaumburg. There WILL be multiple cars on the track, but there is controlled passing. Because this is a Lotus event, they will be showcasing the 2005 Lotus Elise. putting his bull to the test! priority, but the second is to have as much fun as possible. soon at the next Chicago Mini Motoring Club event. too, because it's only 10 bucks to come and watch!!! The Chicago Auto Pre-Show turned out to be a fantastic event. A big thanks to MINIUSA for providing breakfast and a way to see the show early (not to mention play inside the MC40). For those that missed some of the event you can check out some of the more exciting cars of show here: 2004 Chicago Auto Show Gallery. If anyone has any photos they'd like to share feel free to post a link to them in the comments section. What an event! I think it was telling when I asked if anyone would be interested in doing it again and everyone immediately raised their hands! A big thanks to Knauz MINI for donating our grand prize of one full professional detail and another big thanks to Mini Mania for donating our four other prizes. Thanks everyone for coming out! Let try to do this again before too long.